Home > The Blog about Blogging > Internet > Blogging > Blog for You, Not for the Money! Blog for You, Not for the Money! Over the years, I have come across many different people in the online world. People that are dedicated to their cause, people that just want to make a buck, and others that just learned how to use email. I tend to not really deal with too many people that have just learned the great wonders of the internet, but still come across them. I know that they will catch up with technology at some point. My main concern is with the people that are just online to make a buck through blogging. There are so many different ways to make money online that it tends to lean toward ludicrous. A good majority of people start blogging online just to get their feet wet and then find out that they enjoy it. These are the people that I applaud. If you are working on a project online that you enjoy, then go for it and keep doing what you are doing. The reason why most people fail to make a name for themselves or make any money is because they are trying to make money doing something that they do not enjoy, or know nothing about. that are making money off of you. Will you make money with their software or idea? Most likely not. The main reason this is true is because you are looking at this with pure dollar signs in mind, not if you actually enjoy it. The thought of making money is on the forefront of minds these days with the massive US recession, but doing it online is very difficult. There is so much competition to contend with that you will quit before you make any money. Most people that I have spoken with spend more starting up the website or blog than they ever will make. This is just not a good business practice. Creating blogs based off the most popular keywords or highest margin adsense topics will only result in failure in the long run. There are millions of sites that are already established and running for the same thing you are. Starting in this type of environment is a leading cause of failure. If you want to succeed online, the one thing I ask you to do is stay true to what you love. 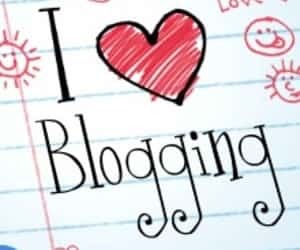 Blogging was created in order for people to voice their opinions, concerns, and views about anything that they pleased. After a while, people found out you could make money blogging. Then everyone tried to cash in and the industry became over saturated. If you want to make money online with blogging, then stick with a topic that you are knowledgeable in and you actually enjoy. If you can do this, then blogging will become fairly easy. Remember that it can take a year to start getting good traffic to your blog and then you can start monetizing it. Once you build a solid reader base, then you can start showing them ads for things that are relevant. People respond better to ads if they know the site well and understand the topics that are being discussed. Knowing the topic that you are blogging about will keep you blogging for a long time because posts will be able to be created with ease. If you try to make a blog just to make money, you will spend more time researching, then writing. Keep true to passions and the money will come in later.